The Thief is a covert operative. His ideal circumstance is to get into places blocked to others, grab things he's not supposed to have, and get out without anyone ever knowing he was there. If he can sell what he grabbed for a tidy sum, that makes for a perfect day. 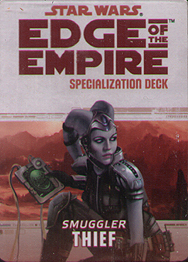 This deck requires the Edge of the Empire Core Rulebook and includes cards for all 20 talents available in the Thief specialization.